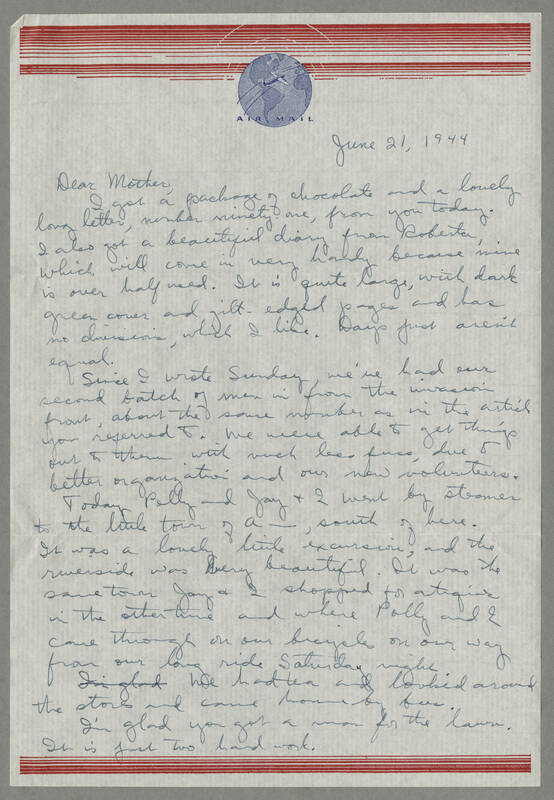 June 21, 1944 Dear Mother, I got a package of chocolate and a lovely long letter, number ninety-one, from you today. I also got a beautiful diary from Roberta, which will come in very handy because mine is over half used. It is quite large, with dark green cover and gilt-edged pages and has no divisions, which I like. Days just aren't equal. Since I wrote Sunday, we've had our second batch of men in from the invasion front, about the same number as in the article you referred to. We were able to get things out to them with much less fuss, due to better organization and our new volunteers. Today Polly and Jay and I went by steamer to the little town of A----, south of here. It was a lovely little excursion, and the riverside was very beautiful. It was the same town Jay and I shopped for antiques in the other time and where Polly and I came through on our bicycles on our way from our long ride Saturday night. We had tea and looked around the stores and came home by bus. I'm glad you got a man for the lawn. It is just too hard work.